Last week still continued to be hot fishing! After I had already submitted last weeks report, I took the day off to join my buddy John and his brother Colin to take part in the District of North Vancouver Fire Charity Fishing Derby at Lion’s Gate Marina. There were just over 50 boats and 170 entries. In past years that meant a lot of boats fishing the mouth of the Capilano, which made it very challenging. This year the majority of the boats went to the south arm and we all had an epic day, with most boats having multiple fish on. When we got back to the dock I was amazed at the quantity of large chinook that came in. 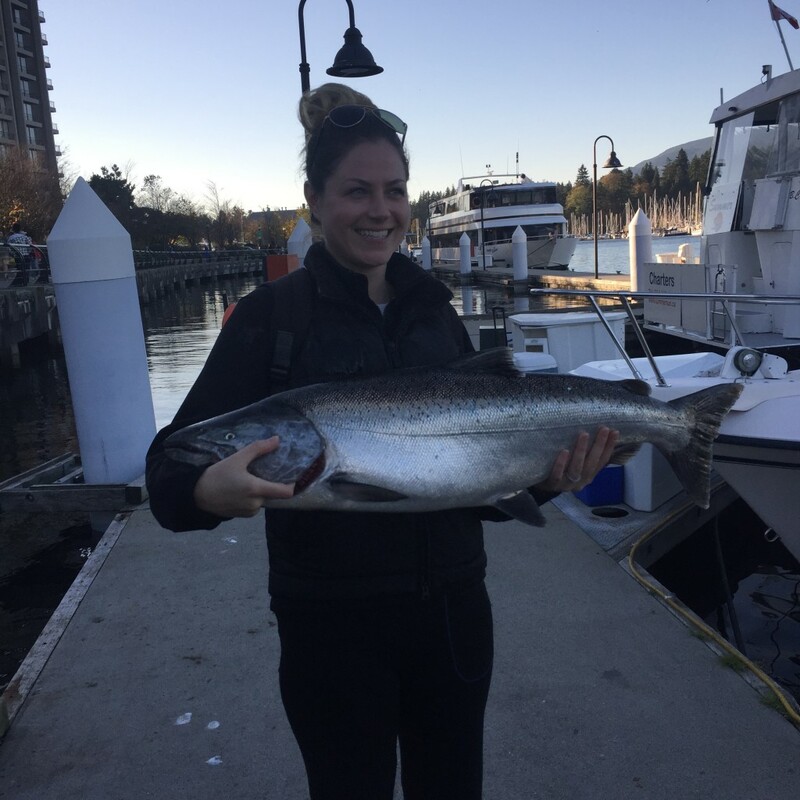 A total of 74 Chinook were brought in to be weighed with first place taken by a 30lb chinook, second at 28lbs and third place was close with 3, 27lb’rs. I’d say the majority of the fish were from the high teens and well into the 20lb+ range! We went home happy at 9th place with a 22.3lb Chinook. It was so surreal to see the dock full of happy anglers and large fish with the Vancouver skyline as a backdrop. 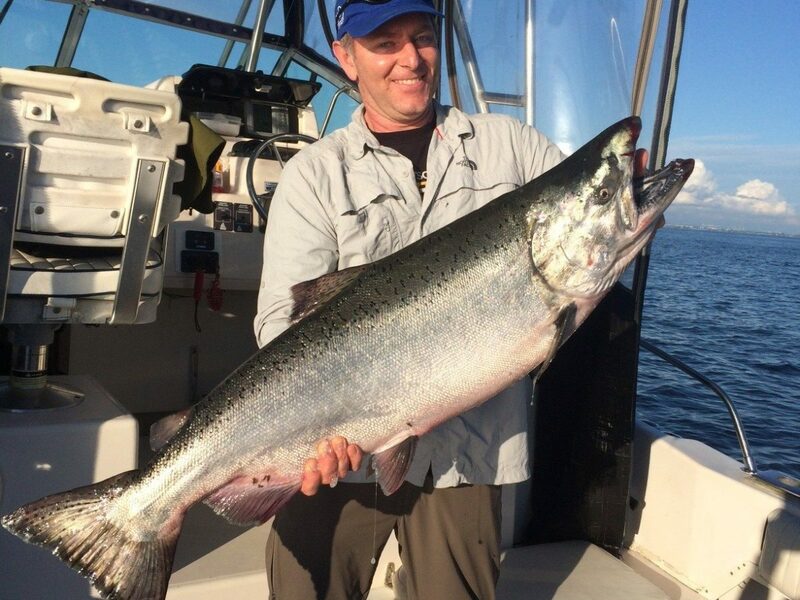 Absolutely world class fishing right at our doorstep! I’d like to take this opportunity thank Oliver Schmaler, Ron Johnstone, Mike Langley, Nathan Walker and their crew for all the hard work in putting on such a great yearly event. It was back to work after that with local trips at the mouth of the Capilano and as I mentioned in my last report I’d kept my fingers crossed for this fishery to come on and it did! Although the wind was blowing pretty hard we did manage to get 2 of the 3 chinooks in the boat of which one was 27lbs and would have been a contender for the previous day’s Derby. The Capilano continued to produce multiple fish throughout the week, which was a great local option for the few days it was too windy to venture south. In terms of gear and fishing depths we’re still fishing in the 70′ to 50′ range except for when fishing the Capilano and hugging the bottom and anchovies are working best. 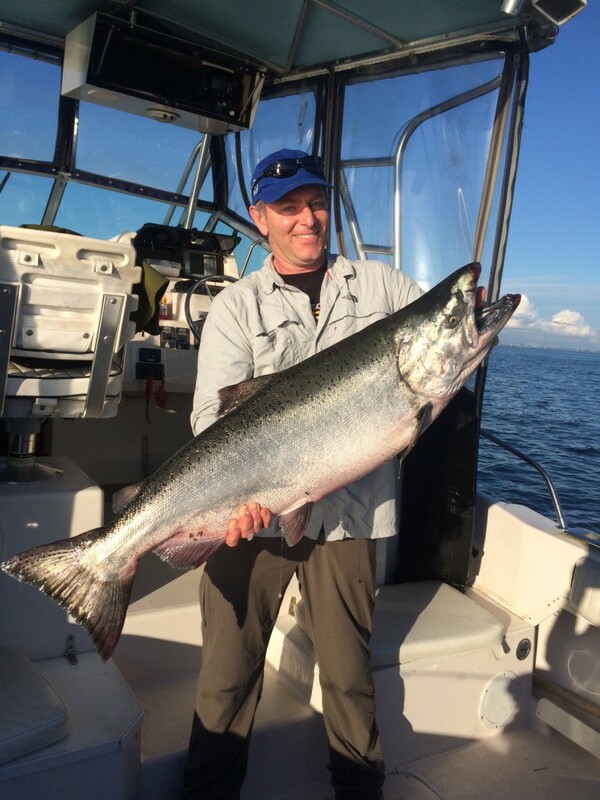 There’s coho around so the 30′ range is a good bet and will hook Chinooks as well. Good teaser heads are the spackle back in the light and dark versions, glo green, bloody nose, purple haze, UV clear and clear green. I’ve seen so many different flashers used it’s hard to say which are the best but my favorites are chartreuse or green in double glo or half mirror reflector. Mix and match and you’ll find you’re favorites. I expect the Capilano, Bell buoy, North Arm, T10 and South Arm to continue to produce since there is little to no rain forecasted for at least another week! For almost 10 straight days we had some great fishing down at the ‘Sandheads’ (South Arm of the Fraser River) The recipe of a full moon, big tides, staging fish and lots of them made for some epic fishing. Lots of fish and some big ones made for some exciting days. Averaging anywhere from 6-15 hookups on a tide swing, it was hot and heavy when the bite was on. Some times making it difficult to keep lines in the water. On more than one occasion I was forced to fish 2 rods, because that’s all you needed. The fish were fairly tight to the ledge, spread out from Crab Pot Bay to the Green Can. The best depths all week were 40-70 feet deep. Fishing a glow flasher with a glow teaser head is the ticket. My 2 favourite combo’s by far are the Chartreuse glow flasher/silver tape matched with a Chartreuse Splatterback teaser on the bottom rods and Oki’ Tackle Green Onion Glow Flashers with the Lemon lime white glow teaser on the top rods. After running out of bait one day (apparently 3 packs wasn’t enough) I clipped a ‘big ugly’ (UV Double Skirt Hootchie) to the Green Onion and a 4” Pesca Bogart to the Chart. Glow flasher, bumped up my speed and started getting them on the hardware. At this time of the year, with the big fish around, its time to bump up your rigging. On my teaser setups I run 30lb Maxima leader with #2 trebles and 5/0 trailer hooks. My hootchies are tied with 50lb leader and my spoons with 40lb. Alan with a 32lber landed at Sandheads. Some fish showed up at the Capilano in the last 48-72 hours, after the full moon, tides and what not. We will see how many are left to come. It’s such a cool fishery being that you can catch big aggressive chinooks minutes from the dock, let alone your front door in the awesome metropolitan city we live in.